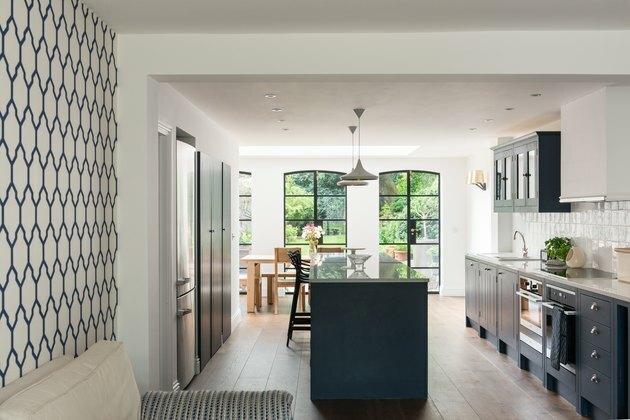 For a family of four living in a closed-off house in London's Canonbury district, having an open floor plan with access to their exterior garden was a dream. 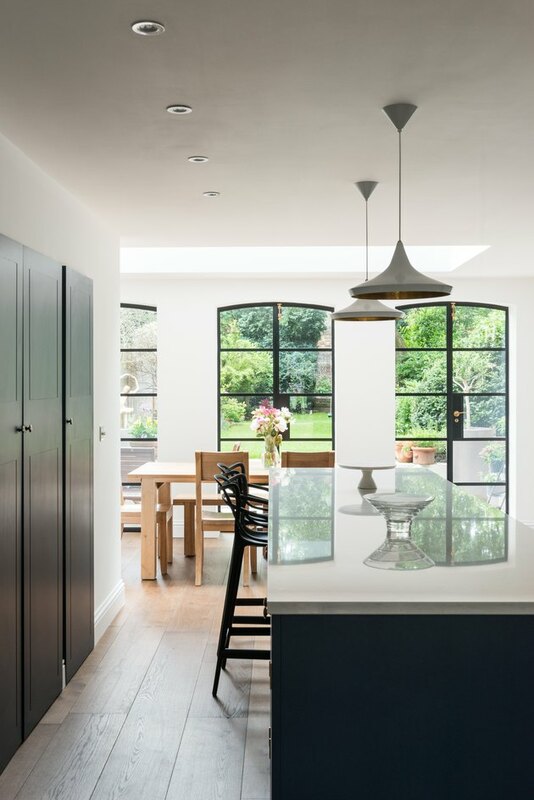 They wanted to enjoy a design that combined the kitchen, dining, and living areas into one space with lots of natural light — but that vision seemed like a tall order. "The previous layout had been segregated, dark, and limited, with a lack of connection to the garden," Matthew Wood remembered, who's the founder of MW Architects. Wood had already completed an upstairs renovation for the family, so the clan hired him again for this transformation. "The building was very tall, and so the challenge was to open it up as much as possible whilst getting in enough structural steelwork to support the large walls above," Wood said. By designating the kitchen as the darkest part of the plan, the team was able to create a dining area that would open on to a new patio. 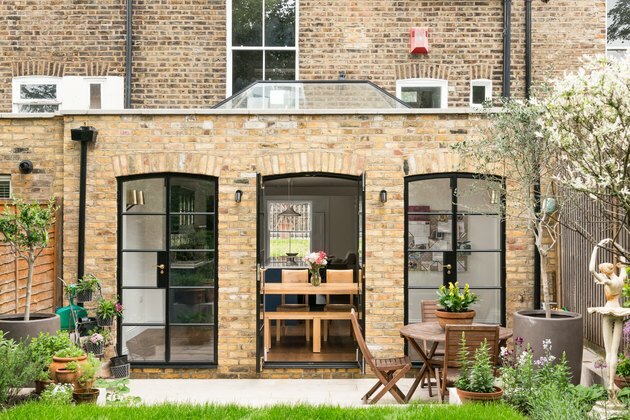 And along with a contractor and structural engineer, they created an outside extension that's as close to the original historic design as possible. The finished result is an airy, light-filled haven that's surely the heart of the home. 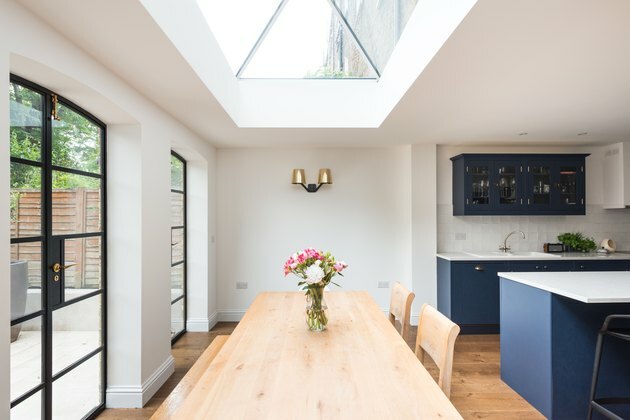 A sunlight on the extension's roof by Global Skylights brings more natural light directly to the dining room table. The bespoke doors with curved tops from Fabco Sanctuary open to the exterior garden. "It was vital to get as much light as deep into the plan as possible," Wood said. "We actually chose to set the kitchen in the darkest part of the plan so that the dining area could open up on to the new patio." 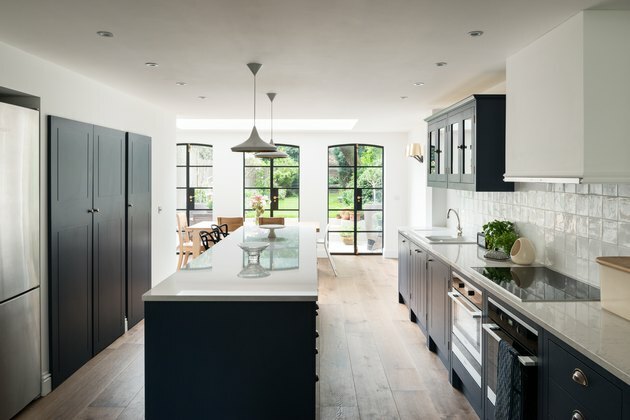 The kitchen, which was constructed by E&C Building and Design Ltd, was designed by BS Kitchens. 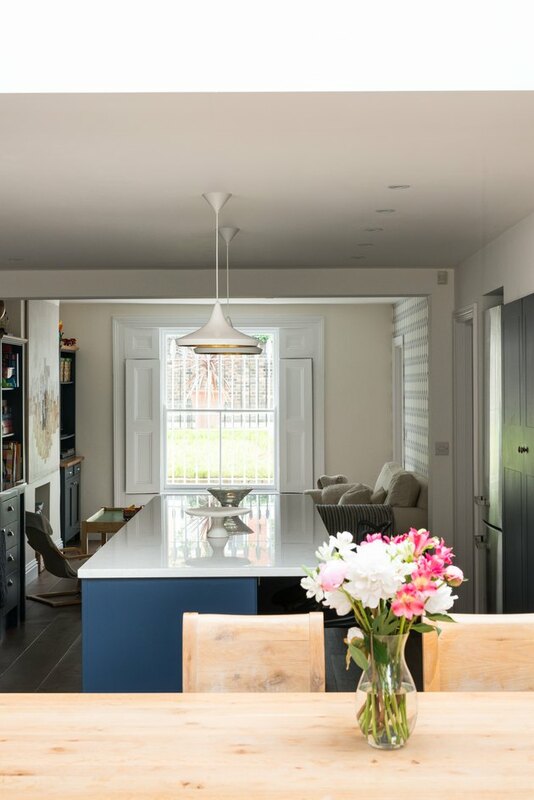 The cabinets were painted "Drawing Room Blue" from Farrow & Ball on site. 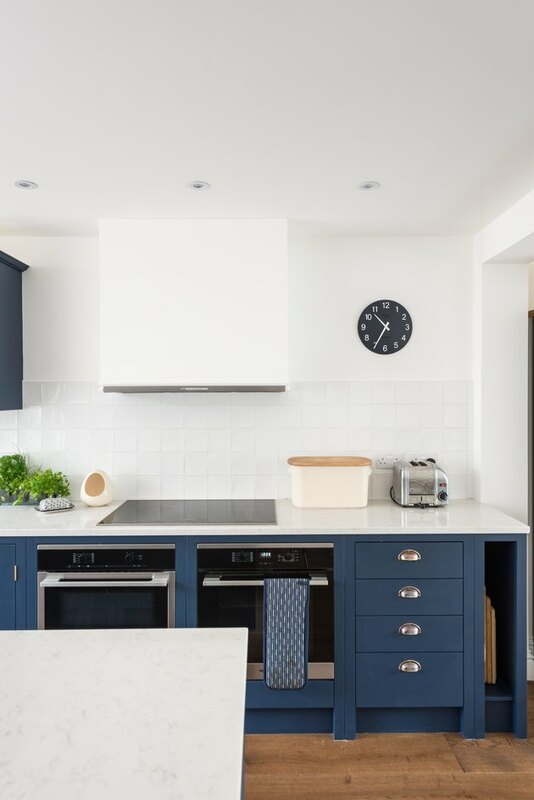 Lagoon Silestone by Touchstone Worktops covers the countertops, and pendants from Tom Dixon can be used when the natural light is not enough. Timber floors by Havwoods stretch under appliances by Miele. The living room furniture was owned by the family before the renovation. The firm used details, like this wallpaper from Farrow & Ball, to blend the old with the new. 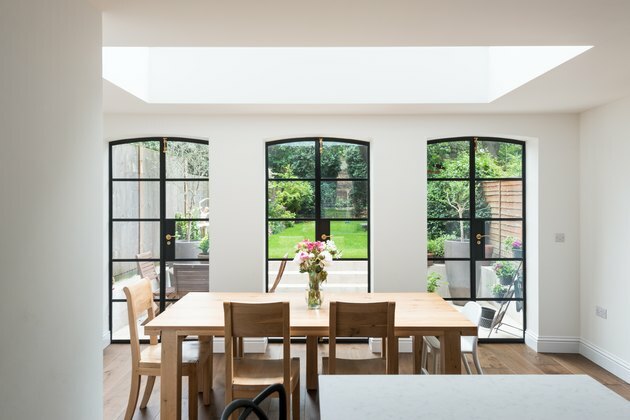 Hand-formed arches built from reclaimed London Yellow Stock brick kept the extension "quite traditional," Wood noted. A lantern-type roof light also helps elicit the historic significance of this Victorian property.